Your dog is going to chew… it’s just a part of being a dog. And it’s quite an important part, too! Whether they’re a puppy or an adult dog, all dogs need to chew. Puppies chew when they’re teething or just to explore the new world. Then they continue through adulthood to keep their masticatory (chewing) muscles strong, their teeth clean, and their brain engaged. Because chewing is good for your dog’s mental and physical health, it’s important that you provide them with plenty of safe and appropriate things to chew on. Fail to do so and they’ll come up with their own chew “toys,” which often wind up being your most expensive pair of shoes, the legs of your dining room chairs, the nearest electric cord, or even your arm! None of which are desirable, and several of which are downright unsafe! There are a LOT of dog chews and chew toys available these days! Which ones are best? Which should you avoid? To help, we've put together this 3-step guide so you can "chews" wisely (and safely). And, since no two dogs use a toy the exact same way (see “Chews-onality” section below), we’ve also included a few words of caution about the different types of chews and chew toys so you can best assess which types might be best for your dog and so you can know what to look out for if any problems arise. Before you go chew toy shopping, it's important to know what type of chewer your dog is: their "chews-onality." Which one of these best describes your dog? INHALER: Now you see it, now you don't! Inhalers bite off large chunks of edible chews and swallow them fast — which is why they're also known as "Gulpers." DESTROYER: These are the dogs that try to (and often succeed in) thoroughly destroying whatever they get their mouths on! They may or may not swallow what they destroy, so be careful because there can be some overlap between a "Destroyer" and an "Inhaler." And these hybrid-chewers can certainly be very difficult to shop for! NIBBLER: These dogs are lovers, not fighters. They take their time and savor their chews and toys slowly, giving them the respect and attention they deserve. 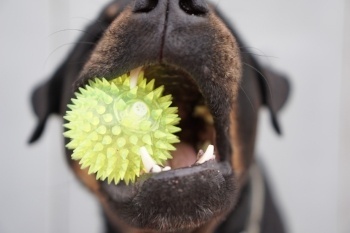 Now that you've figured out your dog's "chews-onality," take a look at the general types of chews and toys that are most likely to be safe and entertaining for your pup's chewing style. 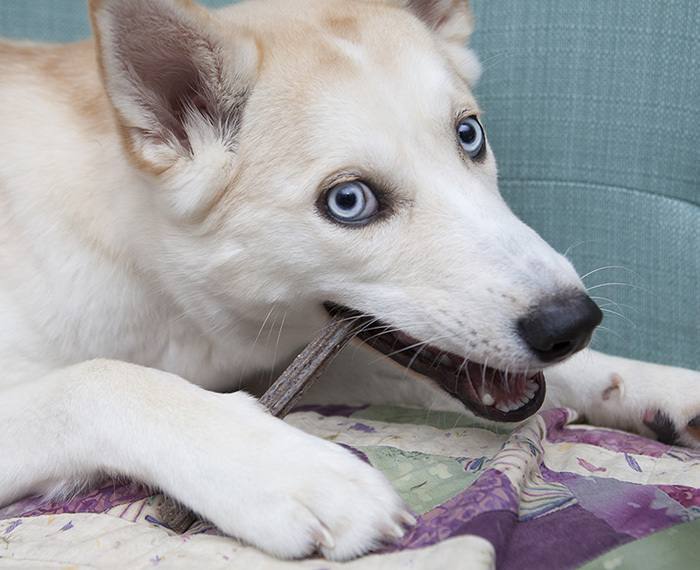 Use this list to pick the best type of chew or chew toy for your type of dog. However, just because something is on your dog’s “best list,” doesn’t mean there aren’t things to watch out for. 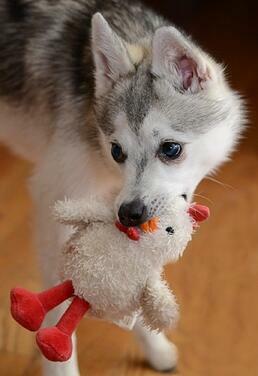 Be sure to check our chew-toy safety tips. Every dog is different and every dog might chew differently. And there is a seemingly endless variety of chew toys. Since it can feel daunting to pick from the gazillions (it’s a technical term) of possible chew toys, follow this simple guide to make sure whatever you pick is a quality product for your dog. Hardness: Apply the thumbnail test: If the toy doesn't “give” a little bit when you press it with your thumbnail, then it's too hard for your dog and could break their teeth. Softness & Durability: The toy also should not be so soft or poorly-constructed that your dog will be able to chew it apart and swallow pieces, chunks, or the stuffing inside. Coating: It should not be coated or treated with flavorings that can cause digestive upset (e.g., the coating on pig’s ears). Size & Shape: It should not be so small that your dog could choke on it, nor of a shape that they could get their tongue or muzzle stuck in it. Washability: You should be able to put it in the dishwasher or washing machine/clothes dryer to be periodically cleaned and disinfected. Entertainment Value: It should be able to provide hours of chewing entertainment and distraction, either because it will last a long time, you are able to stuff it with treats/food, or your dog just really enjoys playing with it. At the end of the day, choosing the things your dog will chew on is likely to involve a bit of trial and error as you get a better feel for your dog based on how they chew and interact with a particular toy or snack. Some chews and toys can provide additional benefits for your dog; like mental stimulation or help with keeping their teeth clean. However, it's also true that chew toys have the potential to cause problems. Always closely observe your dog the first few times they’re playing with a new chew toy or eating a new type of chew. And, even in the long-term, keep watch and if you’re at all worried about a particular toy, don’t leave your dog alone with it, or just take it away and try another. If you notice any of the following, it’s time to take the toy away and schedule a vet visit. The truth is, although some chews are better than others, it’s important to know the potential problems associated with each type of dog chew or toy. Even if you’ve never had an issue, and have friends who say the same, many vets and other dog lovers have seen these problems first-hand. The following breakdown is not meant to scare you. Instead, we hope you will keep these warnings in mind so your dog can enjoy their chewing, and do so safely. So long as they’re not too flimsy, rubber chew toys often represent the safest options for many dogs. The best rubber chew toys are those that are firm enough to stand up to serious chewing, yet have enough “give” so they don’t cause tooth damage. Just make sure that the size of the toy is appropriate for your dog—the better toys come with a handy “size guide” on their packaging or on their website. Giving your dog a toy that's too small could lead to choking, while too large could lead to excessive strain and damage to their jaw and chewing muscles. A longtime favorite among many dog owners, Kong toys are known for their durability and come in different "strengths" and sizes. 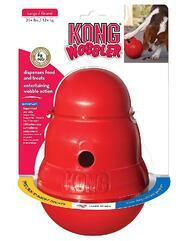 The Classic Kong (featured in the photo above) can also be filled with dry or canned/wet food. (Check out some of the other "stuffing" recipe ideas on the Kong website.) You can even freeze the toys with the stuffing inside in order to extend your dog's play time as they try to scoop out every last bit — plus freezing Kongs can help soothe the pain for a teething puppy. 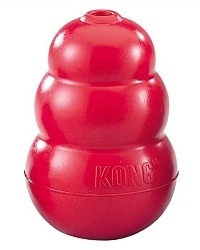 This Kong Wobbler isn't a chew toy, but it's a great interactive treat and puzzle feeder. The top screws off so you can insert small treats. Size Matters: An important warning about choosing the correct size toys for your dogs, including when you have multiple dogs of different sizes. 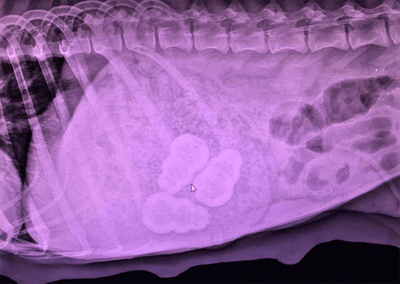 This photo (inset) is an X-ray of a dog’s abdomen. The three snowman-shaped objects you see in the middle of the image are Kongs within the dog’s stomach! They wound up there, not because the dog’s owner intentionally gave their dog the wrong sized Kongs, but rather because their kiddo didn't supervise closely enough while this dog’s puppies were playing with their food-stuffed Kongs! Mom perhaps decided that her pups were having too much fun and wanted in on the action. Or, maybe it was as it so often is, the kids just left their mess laying around for mom to clean up … and clean up this mom did! She had to be taken to surgery to have these three Kong toys removed from her stomach. She’s doing well and lesson learned for everyone. Photo credit: Dr. Mandy Roberts, Hoschton Animal Hospital. This Qwizl treat toy won the Best New Product award at the 2017 Global Pet Expo. Its manufacturer, West Paw, is B-Corp certified, which recognizes "companies all over the world that are creating exceptional positive social and environmental impact." Their proprietary Zogoflex® material is completely recyclable and free from latex, BPA, and phthalate. 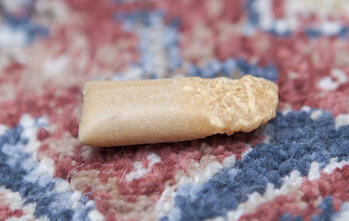 It's ideal for inserting treats, even bully sticks, which makes it take longer for your dog to finish the treat. You can also insert a QChefs® treat (see Hard Dental Cracker below) in the food puzzle, though in our own test the chew is too small to work well with a large Qwizl and is a better fit for the smaller Qwizl. Extra bonus for the Qwizl: it's dishwasher safe! These chews — which include things like Greenies®, QChefs®, Dentastix™, Brushing Chews®, VeggieDent® Chews, and others — don’t last very long and therefore won't provide much long-term satisfaction for your dog’s chewing needs and desires. 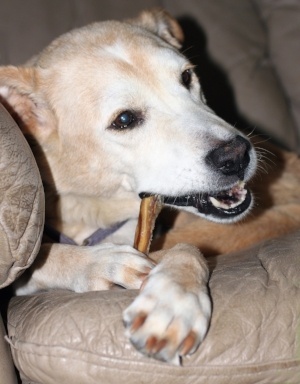 That said, they can provide some help with your dog’s short-term chewing desires and can even provide some help with their dental and oral health, as many of these chews can help minimize or slow plaque and/or tartar buildup. Just be aware that they can also add a fair number of calories to your dog’s diet and should only be given in moderation, especially to a dog with a weight problem. Additionally, these can become a choking hazard or digestive obstruction if your dog bites off and swallows large chunks - so always observe how your dog is chewing and interacting with these and take them away if they're not chewing well or safely enough. Qchefs Dental Dog Chews are new to North America, but these casein (a milk protein, rich in amino acids) dog treats have been available in Germany for some time. They're free from lots of things you might not want to give your dog, like salt, sugar, and lactose. While our own Preventive Vet dogs love the QChefs treats (Nune is enjoying it in the photo above), we haven't seen any studies that prove the specific dental claims the company makes. But the texture and semi-firmness of these treats, which requires a dog to do some serious chewing, is likely to provide some good mechanical "tooth scraping" action and help to clean their teeth. The Qchefs Hard Dental Cracker is pretty tough, much like most bully sticks, while the Puffed Dental Cracker is much softer. If you have a serious chewer, the Hard Dental Cracker is probably best. The Puffed Dental Cracker won't last as long, but should still provide chewing benefits, and it's more suitable for dogs with fewer teeth and/or sensitive gums. A quick note about Qchefs Hard Cheese & Rice Crackers: Based on our experience, the Qchefs Hard Cheese chews (featured below) are not long enough and too hard. The chew is small to begin with – making it really difficult for a dog to grip and chew – and because of its size, it presents a choking and obstruction hazard. It also doesn't quite pass the "fingernail test." 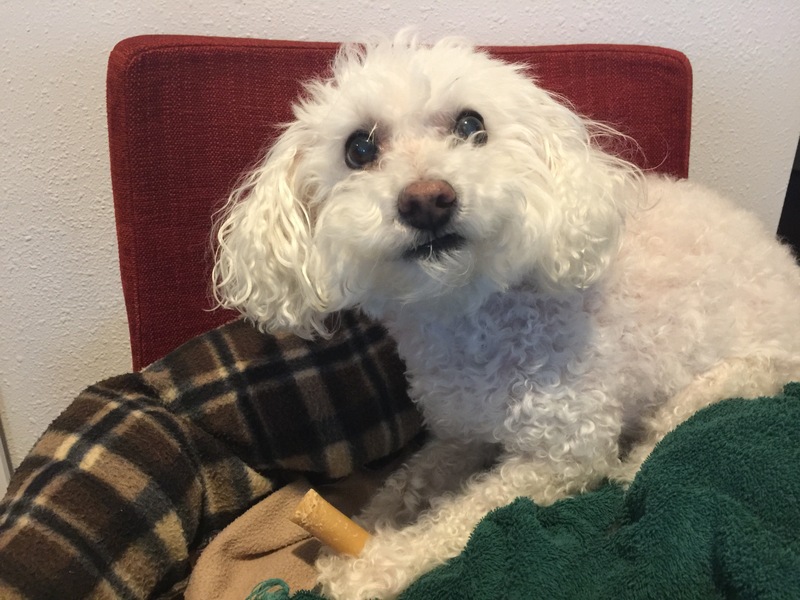 Daisy, a toy poodle and one of the resident Preventive Vet dogs, gave up gnawing on the chew about 1/3 of the way through – she couldn't grip it anymore – and we had to remove it from the premises so our larger dogs didn't grab and swallow the nub that was left. The Virbac C.E.T. 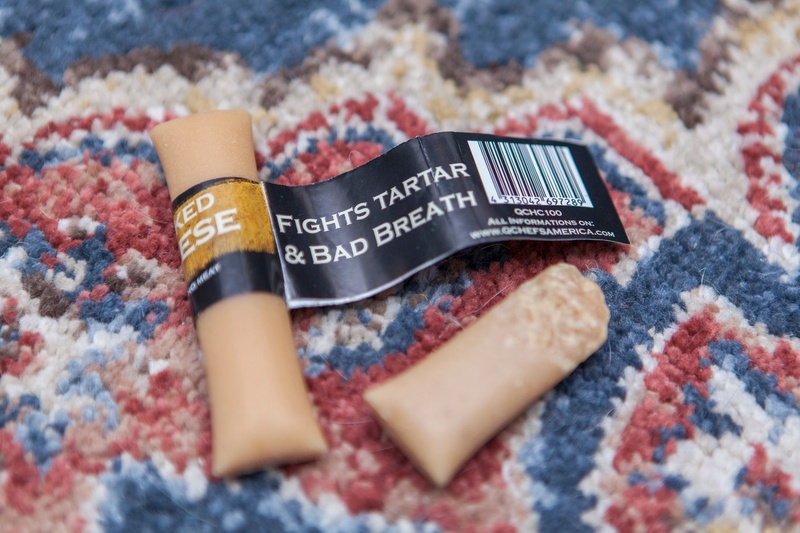 VeggieDent Chews are great because they have been clinically proven to help control tartar (and have the VOHC Seal of Acceptance to prove it), have a texture and density that takes most dogs several minutes to get through, and most dogs love them. You can buy them online or get them from your veterinarian. Virbac C.E.T. Enzymatic Oral Hygiene Chews contain no artificial coloring and are made from carefully selected hides. These chews also include a powerful and beneficial enzyme called glucose oxidase, which helps protect your dog's teeth by breaking down the sugars that disease-causing bacteria feed on. You can buy them online or get them from your veterinarian. Rope toys are generally safe for the right types of chewers. However, plenty of dogs have undergone surgery to remove strands of rope from their stomach or intestines. All “foreign body” digestive obstructions are dangerous (and distressing) for dogs, but the linear foreign body type that comes from strings that make up rope toys is particularly dangerous. That’s because linear foreign body obstructions can saw through a dog’s intestines with severe, painful, and expensive consequences. If you let your dog chew on a rope toy, never let them do so without observation, never leave it laying around, and always take it away if you see the dog pulling out and eating the strands. 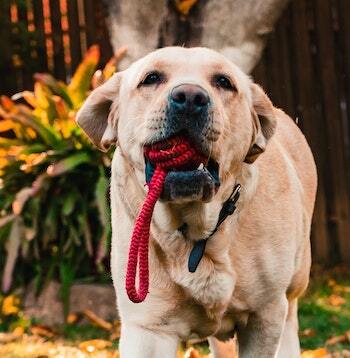 If tug of war is your game, there's a great toy by West Paw called the Bumi Zogoflex Tug Toy. It's also ideal for two dogs to play together. 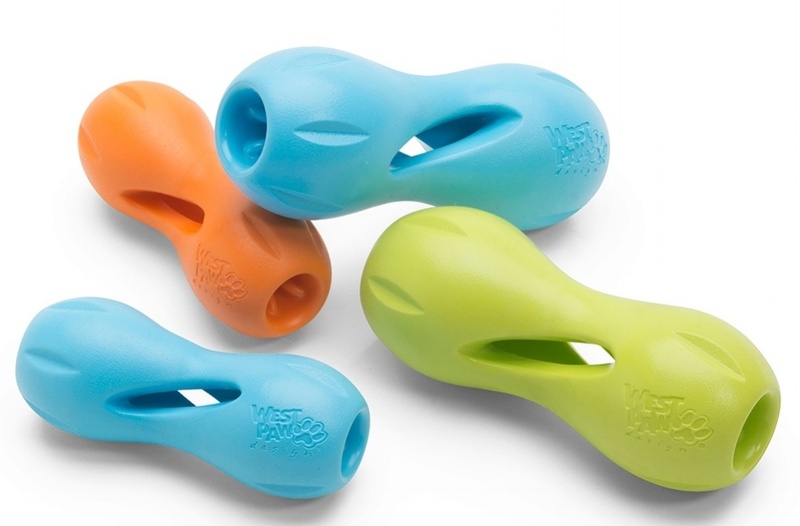 As with all Zogoflex toys, they're non-toxic and dishwasher safe. By the way, playing tug of war doesn't cause aggression if played properly — find out how to teach your dog to play tug of war the right way. Beware of poor-quality and cheaply constructed stuffed toys, lest the covering or stuffing winds up in your dog's intestines, where surgery might be necessary to remove it. The same caution applies to any stuffed toys that have buttons, eyes, bells, and any dangly bits. These are often the first things dogs try to rip off and possibly swallow. Regardless of what type of "stuffie" you get your dog, be sure to take it away and either fix it or throw it away if your dog manages to start "gutting" it. Tuffy Dog Toys come in many playful styles, shapes, and sizes. Touted as the "world's tuff-est soft dog toy," these toys can usually stand up to some pretty good chewing and games of tug of war. There's a variety of Tuffy Toys to choose from, ranked in terms of their "tuff-ness" and ability to withstand chewing and rough play. In this video, Preventive Vet dog, Marshall, can be seen playing with his Mighty Bone. Despite not being as durable as the Tuffy brand, it's been a huge hit with Marshall, who likes to test the limits of all of his toys. This toy has done surprisingly well at withstanding his chewing and tug of war. It's also light, large enough for him to easily catch in his mouth, and soft enough for the times he doesn't catch it and it bounces off his head. He's 10 years old and this is the first time he's actually been able to play catch like this. It turns him into a puppy every time. If your dog starts to tear off pieces of the balls, it can lead to a digestive tract obstruction if swallowed. 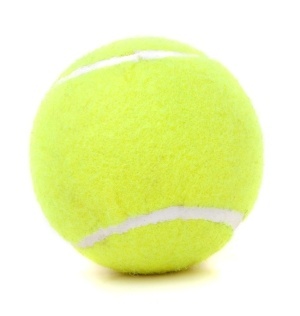 Tooth decay from the repeated abrasive action of chewing the tennis ball fuzz can lead to tooth pain and other long-term problems if left unchecked. Possible lead contamination has been a problem with a few brands of tennis balls —even ones made specifically for pets. Check this article to learn which brands to avoid. If you notice that your dog’s teeth are wearing down, it’s time to give up the tennis balls and find a safer, less abrasive chew toy. They can still play fetch with the ball, but shouldn't spend time chewing it. Is your dog an inhaler, destroyer, or nibbler? We’d love to know more about them and the types of chew toys you’ve tried. Any other types of chews you’d like to suggest, or even words of caution? Let us know in the comments! Know any Dogs or Cats Who Would Love to Gift Their Owners with Preventive Education? Buy our 101 Essential Tips books. Priceless information for less than $10.